25.Jan.09 - This Saturday more than 1000 migrant 'guests' in the 'Centre of first Reception' (CPA) of Lampedusa have escaped from the detention centre, forcing the entrance gates and getting past police controls. They joined a demonstration by residents who were protesting plans to open another detention center on the island. The immigrants who escaped from the detention camp, participated in this demonstration towards the square in front of the Town Hall shouting slogans including 'Freedom' and 'Help us'. On Sunday most migrants had gone back to the detention centre but they are now free to come and go as they please. The 'centre of first reception' (Cpa) in Lampedusa also functions as a 'centre of identification and expulsion' (Cie). Further, following the 'emergency' caused by new arrivals, the minister Maroni ordered the opening of a new Cie, against which both the residents and the migrants are protesting, although for different reasons. Yesterday the residents stopped a bus with 110 migrants directed to the new Cie and held a demonstration against the new Cie and the whole situation in Lampedusa, with some 4000 people taking part. Many migrants who had escaped from the existing centre joining the demo. Today the residents are on general strike. There seem to be no hostility against the migrants and many residents have been feeding them after the mass escapes, that led to the centre being left empty this morning at dawn, after the remaining migrants in the centre tore the gates down. 700 migrants had already escaped yesterday. The total number of migrants who have escaped is estimated to be 1300. The police and carabinieri stood by as the migrants marched towards the Town Hall shouting 'Freedom' and 'Please help us'. The migrants would like to be left free to continue their jouney towards Italy and Europe, where many have families. They feel they haven't been treated with dignity and humanity. Amnesty International, Save The Children, Cir, Asgi, Medicines Sans Frontieres and other associations had already denounced the situation in Lampedusa and the possibility of serious human rights violations. 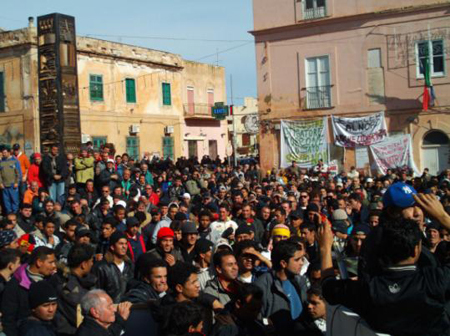 The UNHCR had also expressed their concern, since many of the men women and children confined in Lampedusa are refugees. Italian prime minister Berlusconi is blaming the Left for 'instigating' the migrants - as they had sent a delegation that criticized the centre.